At Business China, we specialize in setting up joint ventures in China. 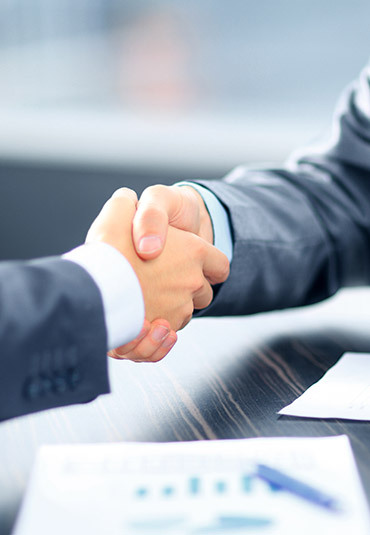 Serving business owners for years now, we are a trusted, experienced and leading company for joint venture registration in China, and other services like opening of the bank account, work visa application and accounting. Whether you want to learn about establishing a joint venture in China, or need assistance with the registration process, understand joint venture in China requirements or the law, or get in-depth insights about creating a joint venture in China, we can assist you with them all. We are experienced, professional, and we are ready to assist you with your joint venture agreement in China. As the name suggests, joint venture (JV) is a process where two or sometimes even more business parties decide to start a company or a venture together by jointly investing in it or owning stakes. As it is a joint venture, profit and loss is shared based on the investment proportion. If you wish to start a joint venture in China, then you must be familiar with and have a sound understanding of the law and legal system of the People’s Republic of China on Joint Ventures and JV agreements. Also, both JV partners must share profit and loss risk. Furthermore, foreign investors are usually economic organizations, individuals and enterprises while Chinese JV partners are currently limited to commercial organizations and enterprises. It excludes individual enterprises and individuals. The organizational form of the Chinese-foreign joint venture is Limited Liability Company with the status of a legal entity. As a shareholder, both parties of the joint venture shall bear limited liability for the debts of the enterprise. Among the shareholders of a Joint Venture, the alien side could be foreign companies, enterprises, other economic organizations or individuals, while Chinese team only includes Chinese companies, enterprises, and other industrial organizations, except to Chinese citizens. For the registered capital of starting a joint venture in China, the proportion of the contribution of a foreign party shall not be less than 25%. The Chinese and foreign party shall profits, losses and recover the investment under the proportion of capital contribution. Joint Venture shall not have the shareholders' meeting, and its supreme authority shall be the board of directors. The members of the board of directors shall allocate according to the proportion of investment and the articles of association of the Joint Venture. Joint Venture shall not have a veto on the directors appointed by the other party, but the qualifications of the directors shall not violate the provisions of the company law on the criteria of the directors. According to joint venture China law, all provisions on the contribution of the parties to the JV have been approved by the State Council on December 30, 1987, and issued by the Ministry of Foreign economic relations and trade, and the State Administration for Industry and Commerce on January 1, 1988. All business owners who are concerned about the joint venture China advantages and disadvantages should read the following articles pertaining to the joint venture agreement in China. According to the Law of the People's Republic of China on Chinese-Foreign Joint Ventures and other relevant laws and regulations, the following rules formulated to protect the legitimate rights and interests of Chinese foreign equity joint ventures. The joint ventures’ subscribed capital contribution, by the provisions of the joint venture contract, must be capital owned themselves, and cannot be the industrial property rights and proprietary technology. The investors shall issue valid certificates of ownership and disposal right in the form of material, industrial property, and proprietary technology. Any party of a creating a joint venture in China shall not be made in the name of the joint venture loans, leasing equipment or other property and joint venture property of others as their contribution, or make any investment guaranteed by the other party of joint venture's property rights and property rights. All parties to the joint venture shall specify the time limit of the investment in the joint venture agreement, and shall pay their respective capital contributions per the terms that have been specified in the joint venture agreement in China. The joint venture shall submit a certificate of capital contribution to the original examination and approval organ and the administrative department for industry and commerce for the record. The parties to the joint venture shall pay the capital contribution once in six months from the date of issuance of the business license. The capital contribution by installments shall not be less than 15% of the subscribed capital contribution and is to be paid within three months from the date of issuance of the business license. These terms need to be included in the joint venture agreement in China. If the parties to the joint venture, for some reason, fail to pay the capital contribution within the time limit prescribed in section 4, the joint venture should be dissolved automatically, and, as a result, the joint venture shall automatically invalidate the certificate. The joint venture shall nullify its registration with the administrative department for Industry and commerce, and hand in its business license. The executive department for industry and commerce shall make a public announcement if it does not apply for cancellation of the registration formalities, and the sale of the business license. After the parties paying the first installment, if the insufficient investment exceeds three months beyond the JV contract, the administrative department for Industry and Commerce (ADIC) shall work together with the original examination and approval authority issue a notice demand the parties within one month to pay off the capital. The original examination and approval authority shall have the right to revoke the approval certificate of the joint venture enterprise without paying the capital contribution under the notice period specified in the preceding paragraph. After the revocation, the joint venture shall handle the cancellation of registration procedures, for instance, cancel the business license and liquidate the creditor's rights and debts. If the business license has not renewed and the business license revoked, the administrative department for industry and commerce shall have the right to cancel its business license and notify the public. If any party of joint venture fails to pay or pay off its capital contribution following the provisions of the joint venture contract, it will constitute a breach of contract. The non-breaching party shall urge the defaulting party to pay or pay off the capital within one month. If the party fails to pay or pay off on time, it shall, as the defaulting party, give up all rights in the joint venture contract and automatically withdraw the joint venture. The keeping party shall, within one month after the expiration of the time limit, apply to the original approval authority to ask for ratifying the dissolution of the company or seeking another party to bear the rights and obligations according to the joint venture contract. The non-defaulting party may, by the law, require the defaulting party to compensate for the economic losses caused by the failure to pay or pay off the capital contribution. If the defaulting party in the preceding paragraph has paid part of the contribution by the provisions of the joint venture contract, the joint venture shall clean up the input. If the party fails to apply to the original examination and approval authority by the provisions of the first paragraph, it shall have the right to revoke the approval certificate of the joint venture. After the approval certificate withdrawn, the joint venture shall handle the cancellation of registration procedures and cancel the business license with the administrative department for industry and commerce. If the regulatory authority for trade and commerce has the right to revoke its business license by not handling the cancellation of the registration procedures and the cancellation of the business license, the administrative department for industry and commerce shall have the right to revoke its business license and make a public announcement. If any party of the joint venture which has a business license before the implementation of the present provisions fails to contribute before the time set in the contract, it should pay within two months accordingly. If the capital contribution has not been paid up within the time limit specified in the preceding paragraph, it may deal with by the provisions of articles fifth to seventh of the present rules. If the parties of the JV has a business license before the implementation of the present provisions have not stipulated their investment period in the joint venture contract and have not paid the capital contribution, the parties shall sign a supplementary agreement regarding the time limit of capital contribution within two months. The parties shall report to the original approval authority to get approval. Once approved, the parties shall notify the public security organ. The parties did not sign the supplemental agreement within two months of the contribution period, and have not paid the investment, resulting in a joint venture’s business license, and as a result, cannot build or cannot be opened for six months because of the issuance date. The original examination and approval authority shall have the right to revoke the approval certificate of the joint venture. After the revocation, the joint venture shall make a cancellation registration procedure with the administrative department for industry and commerce, and cancel the business license. If the business license is not registered and the business license revokes, the regulatory authority for trade and commerce shall have the right to withdraw its business license and make a public announcement. Article 11: This regulation shall come into force as of March 1, 1988. If you are interested in starting a Joint Venture in China but don’t know where to start then the following lines will give you the information you need. While establishing a joint venture in China, the establishment of a Chinese-foreign joint limited company needs to follow the industrial policy of China's utilization of foreign capital, since the new business will currently be limited to the industries that have foreign investment encouraged and allowed by the state. It is important to note that the state prohibits the establishment of enterprises with foreign investment industries and the industries that have the contract term according to the interim provisions on the term of operation of Chinese-foreign joint ventures, shall not set up Chinese-foreign joint limited company. The minimum registered capital of the proposed Chinese-foreign joint limited venture is 30 million RMB (if listed, 50 million RMB are required). Shares which foreign (overseas) shareholders subscribed shall not be less than 25% of the registered capital of the company. While establishing a joint venture in China there should be more than 5 sponsors, at least one foreign (overseas) for shareholders among them. The others are to be considered as legal persons in China. If a joint venture agreement China is set up in the form of fundraising, apart from the aforementioned conditions, at least one of the sponsors must have a record of consecutive profits for the first three years of the company's shares. If the sponsor happens to be a Chinese shareholder, they shall provide the financial report of the audit of certified public accountants in China for at least the past three years. If the sponsor is a foreign shareholder, then a financial report shall be provided for the audit of the certified public accountant by the foreign shareholder. The shares subscribed by the sponsors shall not be transferred within 3 years from the date of the establishment of the company. When the term expires, the initiator shall not violate the provisions of the minimum 25% of the shares held by the shareholders of the foreign party and shall be approved by the original examination and approval authorities. The Chinese side must be a corporate legal person and has been established for more than one year. Foreign side shall either be enterprise or individual. Registered capital: The technology, service industry shall be no less than $100,000, and the production and processing industry shall be no less than $150,000. None of the parties shall contribute less than 25% of the registered capital. Foreign investment must be foreign exchange. The joint venture in China must conform to the guidance catalogue of foreign investment industry issued by the state council. The Joint Venture project proposal shall make a detailed statement in the local resources, investment environment, land use condition, enterprise history and status quo; the advantages that the joint venture have in the technology, product and markets; preliminary feasibility plan of the project and so on. To find out more about our services please feel free to contact us at +86-020-2917 9715, or send us an email with your queries to proposal@set-up-company.com.